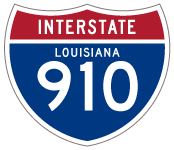 I-910 added the southern portion of the Pontchartrain Expressway, the Greater New Orleans / Crescent City Connection Bridge and the freeway portion of the Westbank Expressway into the Interstate system. Signed in the field as Business U.S. 90, Interstate 910 is the hidden route number for the West Bank Expressway. This designation is a precursor to the Future Interstate 49 extension, which may take over all of existing I-910 once it is constructed parallel to existing U.S. 90 between Lafayette and the greater New Orleans area. The Interstate 910 designation came to fruition when it was approved by AASHTO on October 1, 1999, but it was not signed. The October 31, 2002, Interstate Route Log and Finders List, published by the Federal Highway Administration, revealed that the Interstate 910 designation is official on its Auxiliary Routes page with 9.70 miles. The signing of the Westbank Expressway as I-910 is still on hold due to the inclusion of this section of highway in the Future I-49 Corridor. The Department is about to initiate work on an Environmental Impact Statement for 37 miles west of the Westbank Expressway. At the conclusion of that study, we will be in a better position to determine how to proceed. Since that time, the Interstate 910 designation remains unsigned and no further plans to post it were announced. As originally envisioned, I-49 South will extend southeastward from Lafayette to Morgan City, east to Houma and east northeast to the Westbank Expressway and New Orleans. The east end is not set in stone however, as I-49 South may instead turn northward at Boutte and overtake Interstate 310 to end at I-10 by Kenner. Should that be the case, I-910 may remain indefinitely in place along U.S. 90 Business. The first guide sign on westbound Interstate 10 for U.S. 90 Business (Interstate 910). Interstate 910 begins from I-10 west from a sweeping flyover ramp. Photo taken by Steve Hanudel (08/14/05). Exit 235B departs Interstate 10 west for Downtown and the Mercedes-Benz Superdome as Exit 234C for U.S. 90 Business (Pontchartrain Expressway) west prepares to depart from the left-hand side. I-10 turns northwest onto the Pontchartrain Expressway from near the Superdome to the 17th Street Canal. Photo taken 04/20/02. The three lane westbound viaduct partitions with a two-lane ramp for U.S. 90 Business / Interstate 910 and a two-lane mainline northwest to Mid-City and Metairie. Photo taken by Steve Hanudel (08/14/05). Exit 234C departs Interstate 10 west for U.S. 90 Business. U.S. 90 Business loops southeast across the Crescent City Connection bridge to Algiers before turning westward again to the Westbank. Photo taken 04/20/02. Passing over U.S. 61 (Airline Drive), Interstate 10 eastbound drivers see the first sign for the Pontchartrain Expressway south to the Crescent City Connection bridge and the Westbank. Signs for Exit 234A omit U.S. 90 Business in favor of U.S. 90 until the gore point. Photo taken 04/20/12. As Interstate 10 eastbound approaches Downtown New Orleans, signage shows that the U.S. 90 / Exit 234A transition is a left-hand exit. In actuality, Interstate 10 exits from the Ponchartrain Expressway, turning northeast. Photo taken 04/20/12. Interstate 10 departs the Pontchartrain Expressway toward the Vieux Carre as the U.S. 90 Business designation is finally revealed. U.S. 90 Business follows the left lanes of the transition ramp, taking unsigned Interstate 910 southward across the Mississippi River to the Westbank Expressway. U.S. 90 / Claiborne Avenue traffic departs just after the split with I-10. Photo taken 04/20/12. U.S. 90 travels underneath the Claiborne Avenue viaduct of Interstate 10 from Tulane Avenue west by the Mercedes-Benz Superdome. Beyond this interchange, the US route travels southwestward to Tulane University and the community of Jefferson before crossing the Mississippi River via the Huey P. Long Bridge. Photo taken 04/20/12. Immediately south of its beginning, U.S. 90 Business (Pontchartrain Expressway) partitions with the Claiborne Avenue off-ramp to U.S. 90 and the Superdome. U.S. 90 Business elevates from this point southward to the Greater New Orleans Bridge. Photo taken 04/20/12. Much of the freeway standard sections of the Westbank Expressway are on elevated viaduct. However, the freeway section ends ahead of Westwood Drive. Photo taken 04/20/12. Traffic shifts to the Westbank Expressway frontage road system at the current freeway end. The frontage roads travel at grade to the junction with U.S. 90 near Avondale. Photo taken 04/20/12. 3.3 miles westward, Business U.S. 90 ends at the junction with U.S. 90. 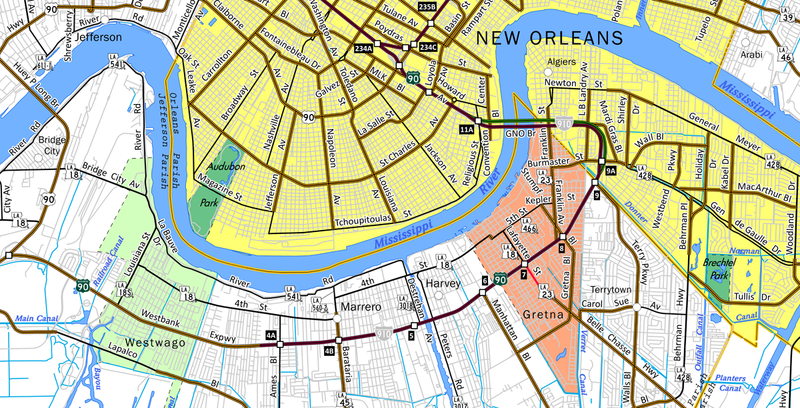 U.S. 90 ventures north to Bridge City and across the Huey P. Long Bridge to Jefferson. Westward, U.S. 90 south continues to Avondale and Boutte along the projected path of Interstate 49 South. Photo taken by Steve Hanudel (08/15/05). Business U.S. 90, from its beginning near Westwego to this point at Marrero, utilizes three lane frontage roads alongside a grassy median. The median awaits the future extension of the Westbank Expressway. Beyond the traffic light at Westwood Drive is the freeway beginning. Photo taken 04/20/12. Two lanes veer away from the frontage road system of the Westbank Expressway onto the freeway beginning. The service road continues to Ames Boulevard, which is Exit 4A from westbound. Photo taken 04/20/12. The Westbank Expressway upgrades to a six-lane viaduct west of Louisiana 45 (Barataria Boulevard). This interchange sequence sign shows the first three interchanges of Interstate 910 and is representative of exit signage along the Westbank Expressway. Photo taken 04/20/12. “Crescent City Connection toll plaza demolition to start Wednesday.” Times-Picayune, The (New Orleans, LA), June 5, 2016. “I-910 MAY PAVE PATH IN N.O.” The Times-Picayune, April 1, 2000. Page updated September 21, 2016.